Join me and an intimate group of ambitious women entrepreneurs for a full day immersive experience to gain the clarity, perspective, & support to propel your business forward in a way that feels deeply aligned for you. Through group coaching, a sisterhood circle, custom oracle card readings, & private "hot-seat" style coaching, we'll create soulful strategies for sustainable success in your business & beyond. During this full day retreat, you'll learn how to work smarter instead of harder, leverage your innate feminine wisdom in your work, & rise into your leadership. Together, we will hone in on your mission + message, vision for growth, critical mindset shifts for success, & a clear action plan to start implementing right away ... that won't burn you out, or leave you with more on your to-do list! Feel overwhelmed by a never-ending list of things you could be doing to launch, grow, or scale your business. Procrastinate taking action consistency and sticking to your commitments in your business. Know that your negative, fearful, self-doubting, or scarcity mindset is holding you back from creating the results you want. Have so many ideas that you don't know where to begin. Are feeling a little slow, stagnant, or stuck in your business. You feel like you're always busy, working hard, + wondering if you're doing enough. You own a business or want to turn your side-hustle into your full-time gig. Need a clear plan of action to bring your ideas to life & generate more $$$$ in your business. A healthy lunch, tea, & snacks throughout the day will be provided. Space is extremely limited to just 7 women, so please register early! Our day together will be most powerful if you get a good night of sleep before, eat a light and nourishing breakfast, and clarify your top 3 desired outcomes ahead of time! Please wear anything that you feel comfortable and beautiful in that allows you to sit and move freely. Light layers are wonderful, as we'll be indoors most of the day, but may venture out for our ritual, lunch, or for some fresh air, weather dependent. A journal, pen, and any altar items (crystals, jewelry, a special totem, anything!) you'd like to bring with you to infuse with the energy and power of our circle are more than welcome! Please bring your full presence, and an open heart and mind. "How honored I am to have been present in this circle... to feel supported, encouraged, and inspired to put my best self forward. Thank you for renewing my hope and reigniting my passion for my own path." "Thank you for sharing your beautiful soul + guiding me to use mine! Your insight was truly inspiring + spot on! I can't wait to start implementing your suggestions + celebrate my victories with you!" "Emily created such an inspiring experience. Gathering in sisterhood in such a beautiful and inviting environment set the stage for soulful conversation, sharing, & opening up. I gained practical tools that I can implement immediately in my business. Emily's wisdom and intuitive guidance was incredible and I'm so grateful for the time we shared!" No refunds will be issued for live events. Your investment can be applied to another product or service with Emily Cassel Coaching if an emergency arises and you are unable to attend. Imagine waking up with a view of the ocean, to the melodic rhythm of waves crashing, and knowing that there’s nowhere else to be but right here, right now. Envision spending a long weekend of beautiful and nourishing days in community with other women devoted to living intentionally, with no one else to worry about but yourself. As ambitious women, we are all in need of sacred space just for us, to honor our pleasure, power, and wisdom, so that we can bring our desires to life, create what we're here to contribute, and live into our soul's callings. This is why we’ve curated a beautiful immersive weekend of meaningful rituals, fulfilling self-care, and learning to live in flow and freedom, so that we can nourish ourselves from a place of devotion and presence and embrace + express the full expanse of who we’re each here to be. THURSDAY - Arrive to our beautiful beach house at 5 pm & join us for dinner at a local restaurant at 7 pm. We’ll all get to know each other and ease into our transformational weekend together! FRIDAY + SATURDAY - Our day will begin with breakfast, followed by a juicy movement class. Then, we’ll gather for a beautiful sisterhood circle to feel into our desires, needs, and wisdom. We’ll close our circle, and head outside for meditation and a ritual, then gather for lunch. After lunch, we’ll have two workshops on Friday, and a surprise adventure on Saturday, then gather for dinner together as a group, followed by free time to explore and play as you wish. Please fill out & submit the form below with your details and we will be in touch shortly! When we think of our “first love,” a picture of ourselves rarely comes to mind. Instead, we consider all the past relationships we’ve been in, and factors outside of ourselves that had us feel worthy, whole, loved, romanced, nourished, and cared for. Join Soulful Success Coach, Emily Cassel, and Yoga Teacher, Sydney Shoff at Inhale Pittsburgh for a cozy winter sisterhood gathering, where coaching and yoga come together to eliminate any barriers that are keeping you from experiencing the depth of your radiant heart. Because women who love themselves have reclaimed the power within to create absolutely anything in this one beautiful life. Because women who love themselves hold the keys within their hearts to truly transform the world from the inside, out. Ready to set your heart FREE, so that you can unleash your full power + potential this Valentine’s Day? Time to light it up, burn it off, and let it go. Out with the old, in with the OM. You ready? Join UFY founder, Meg Gray, and soulful success coach, Emily Cassel, as we gather together and RESOLVE TO EVOLVE in 2018 - through breath, movement, sweat, dancing, celebration and good ol' fashioned holiday cheer! Got something(s) you’ve been grasping onto a bit too tightly? Something grasping on to you - holding you back? Ready to let it all go, expunge, and make some room for the new? Come on in! We will begin our evening as we plant the seeds of intention for the year ahead with a guided meditation and intention setting with Emily. Then Meg will lead us in a heated vinyasa flow sure to empower you to flow & sweat your way into a positive resolution! We will end our practice with a mindful reflection of 2017 - helllloooo midnight savasana! Dancing and champagne toast at midnight to end our evening of celebration, music, yoga and release of EVERYTHING no longer serving you! After this night, you’ll feel like there’s nothing you can’t accomplish in 2018! Gather together to close 2017 on a high note, surrounded by an inspired group of women ready to make 2018 their best year yet! 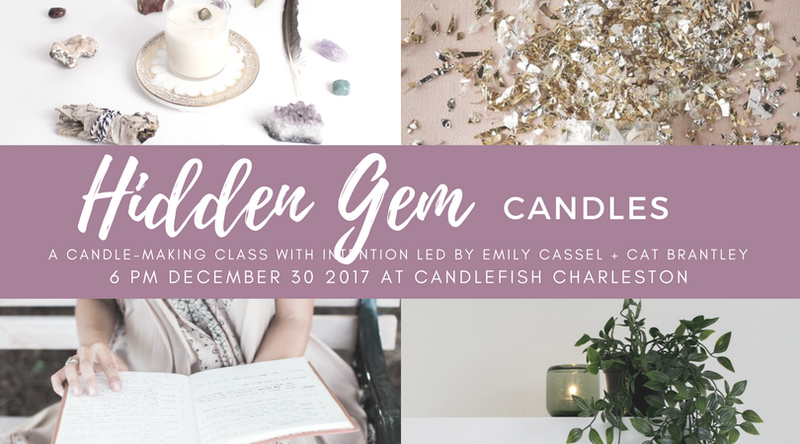 During this workshop, you'll be guided by Emily Cassel, Soulful Success Coach for Women, to set your intentions for 2018 and choose a theme word for what you'd love to master and embody more of in the new year. Carve out some intentional time for YOU, and get clear about what next year holds for you and how you're going to create more of what you desire in every area of your life. Oh... and don't forget your journal, a pen, + a bottle of your favorite bubbly or wine to celebrate a year well-lived, well-loved, and well-led! Expect to leave feeling uplifted, clear, + confident about what next year holds for you, with two custom-scented candles infused with your intentions (and a crystal, for good measure)! “The one-on-one experiences with Emily helped me feel like I could play big & there was clarity manifesting around my journey. I️ feel nourished & nurtured. The support I️ received was invaluable.” - Anna L.
“Your presence allowed me to feel safe and supported to truly open the gates back into my power. The extra little touches of beauty placed along this retreat - flowers, music, meditations, food, fire burning - all together felt like the soulful “home” I️ needed to bring me back to receive and share. I️ will always celebrate this amazing time and place with you and am so grateful our worlds divinely came together.” - Tierney A. “This weekend ended up being exactly what I️ needed to break through the barriers/obstacles that were holding me back. Going into this weekend, I️ knew who I️ was and what I️ wanted, but I️ did not know how I️ was going to serve and use my life’s purpose to inspire and grow others. By being surrounded by your energy & wisdom, which is constantly radiating, I️ now know that I️ am well on my path of living a fulfilled life in which I️ can and will inspire others to live mindfully, healthy, & in balance. Thank you for being so warm, welcoming, & accepting of me and my journey.” - Katherine R.